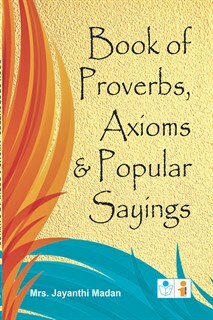 An acclaimed collection of sayings is both entertaining and educational for a wide variety of readers. The book is great for anyone who loves the enlish language. Very low price. Thanks to the author. Book is good but more pages should have been added. The price is can be kept more but more information is required. The book is good for students. All students to read proverbs, sayings and axioms. It will improve their english and morals in life. The book is good. The packaging is very good. The book was delivered in very good condition.